Joe Flacco and the 2014 Corvette C7 were both in the Super Bowl spotlight yesterday. The Baltimore Ravens quarterback was Super Bowl XLVII MVP and will receive a new 2014 Corvette Stingray for getting the honor. General Motors chose not to advertise the new Corvette yesterday during the big show, but it gets the attention anyway. 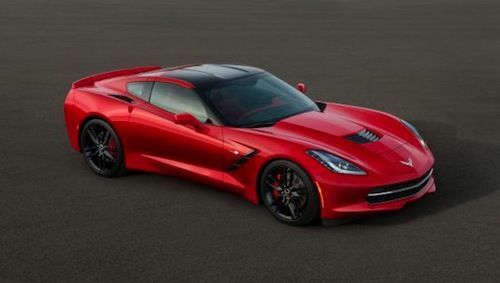 The bright red 2014 Corvette C7 appeared on the field at the Mercedes-Benz Superdome in New Orleans after the game, and while many sports fans overlooked the new Chevrolet sports car, it caught the eye of many auto enthusiasts who were at the big game. And Flacco is about to receive a lot more than the new Corvette after taking home the world title and MVP honors. Like Eli Manning, last years Super Bowl MVP, Joe Flacco won the shiny red new Corvette C7 for winning the Super Bowl honor. But Flacco won’t be able to take his new 2014 Corvette Stingray home just yet. GM used a pre-production model to make the presentation because the new Covette C7 hasn’t entered production yet. Flacco will have to wait until later in the year when the sports car officially enters production at Corvette’s Bowling Green plant in Kentucky in the third quarter. Joe Flacco will receive a new 2014 Corvette Stingray that is the most powerful standard model ever, with an estimated 450 horsepower (335 kW) and 450 lb.-ft. of torque (610 Nm). The Super Bowl MVP’s Corvette C7 will launch from 0-60 in less than four seconds and achieve more than 1g in cornering grip. The all-new Corvette Stingray shares only two parts with the previous generation Corvette. It incorporates an all-new frame structure and chassis, a new powertrain and supporting technologies, as well as completely new exterior and interior designs. Not only will Flacco receive a shiny new red Corvette, but the Super Bowl MVP who passed for 287 yards, threw three touchdowns, zero interceptions and a 95.7 Quarter Back Rating, is about to get a lot richer. Joe Flacco is in the final year of his contract, and will begin to negotiate a new contract to go along with his new Corvette C7 sports car. Estimates as to what Flacco will make annually are in the 15-18 million dollar range. That kind of salary will allow Flacco to buy a number of new sports cars, like a new Ferrari, Lamborghini, or just about any other expensive car that the Super Bowl winning quarterback wants. The newly signed contracts of Drew Brees and Denver’s Peyton Manning have set the standard high for quarterbacks in the NFL. Drew Brees, MVP of Super Bowl XLIV in 2010, signed a 5-year deal in 2012 with a signing bonus of $37 million and worth an average annual value of $20 million; Peyton Manning, future Hall of Famer and MVP of Super Bowl XLI, signed a 5-year deal in 2012 with Denver worth an annual average of $19.2 million. MVP Joe Flacco is in a good position to have his agent sit down with Ravens executives and hammer out a lucrative deal. Later this year, look for Super bowl MVP Joe Flacco to be driving around Baltimore in his new 2014 Chevrolet Corvette Stingray after it rolls off the production line. And if he gets the new contract that is expected, he may have a new garage full of expensive sports cars to drive to Ravens practice this year.